Our Pink Argyle Bandana is a traditional Scottish design which represents the Clan Campbell of Argyll in western Scotland. It is stylish, classy and never goes out of fashion. Used for kilts and plaids, and for the patterned socks worn by Scottish Highlanders since at least the 17th century. 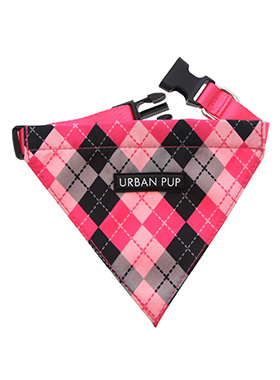 Just attach your lead to the D ring and this stylish Bandana can also be used as a collar. It is lightweight and incredibly strong. You can be sure that this stylish and practical Bandana will be admired from both near and afar. Measure Neck Circumference for collars. Breed guidelines for dog collars.